/ Featured Cities / Buffalo and Niagara Falls: Come for the Food. Stay for the Beauty. New York is a state rich in experiences and adventures, laced with historical intrigue, and topped off with a decadent dash of natural beauty. Buffalo and Niagara Falls are among the most fascinating places to visit in the state, and offer much more than one of the world’s most impressive water falls. From Niagara Falls to lakefront wineries, the Pierce-Arrow Museum, numerous architectural landmarks, nature preserves to jars of preserves, there is no shortage of excitement to be found in this part of New York. In season three of Travel Thru History, we visited West New York and had a blast while exploring its history, art, architecture, and natural beauty. Are you a fan of historical reenactments? If so, you won’t want to miss this attraction. Step back in time to the age of empires, when battles for the Buffalo area raged. Experience the way that soldiers from France, Britain, and the United States lived inside the fort. See how the indigenous peoples of the area survived on a daily basis, and watch artisans recreate the daily experiences of settlers. Old Fort Niagara. Photo via wikimedia commons. Photo by Omegatron. Beautifully sculpted grounds, carefully tended period architecture and exhibits, and hourly musket demonstrations greet visitors year-round. During the peak season, more activities and experiences are available to visitors. Old Fort Niagara, like several historic forts near the Great Lakes, was held by the British, French, and American armies at different points in history. In 1825, this particular fort became less strategically important, with the opening of the Erie Canal. Today, it stands as a living testimony to over 300 years of history. The American side of Niagara Falls is an amazing place. Although arguably the best vantage point for viewing the waterfall is the Canadian shore, there are features of the American side that no tourist should miss. From the Maid of the Mist that brings visitors by the boatload into the heart of this natural cascade’s fury to the Cave of the Winds, hidden behind the Bridal Veil Falls and the breathtaking adventure you go on to visit it, America’s oldest State Park has much to offer. On this side of the falls, you’ll sport a blue poncho, unlike the red ones you get on the Canadian side. Nothing like poncho rivalry. A view of the American, Bridal Veil and Horseshoe Falls from the Presidential Suite of the Sheraton Fallsview Hotel, Niagara Falls, Ontario, Canada. Photo via wikipedia by Saffron Blaze. 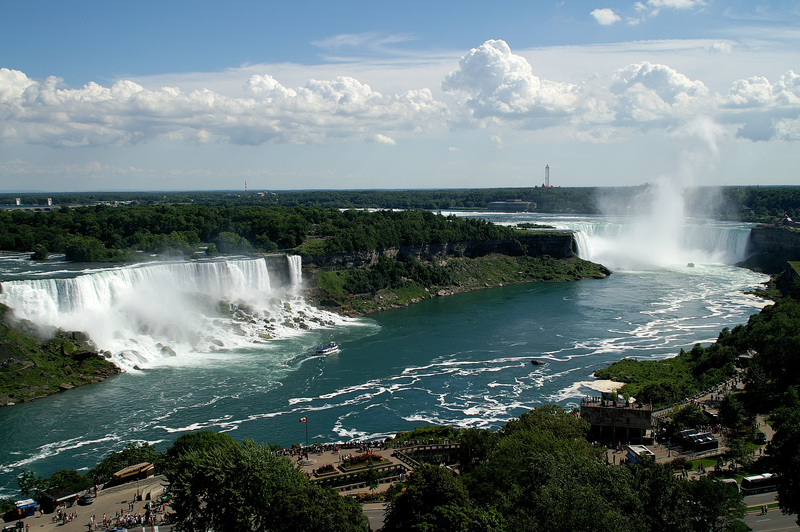 Declared a state park in 1885, Niagara Falls has been one of the nation’s most popular tourist destinations ever since. The off season offers a special treat – I once slid down a curtain of sheer ice that had formed on green grass, to the protective rail along the edge of the Falls. The view was astounding – a natural ice bridge was forming and the view was breathtaking. Spray from the falls fell to the ground and froze instantly, creating the carpet of ice that had deceived me. The Falls in winter were an attraction for past generations, as well. Until 1912, the ice bridges were common recreational sites for families. Three lives were lost that winter when an ice bridge broke, and pedestrian access to ice bridges was forbidden as a result. Other not so bright ideas for recreation on the Falls include historical incidents involving individuals throwing themselves over the falls in tubs, barrels, and other devices – or sometimes unprotected. Some of these incidents were suicide attempts, but in at least one case, a person survived. 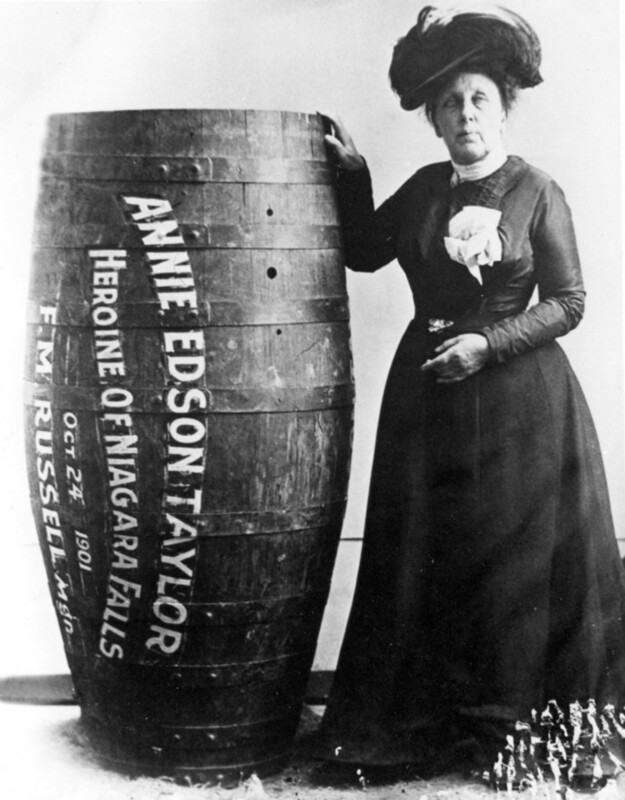 63 year-old Annie Edson Taylor propelled herself and her cat over the Falls in a barrel in 1901, hoping to make a fortune and grow famous. Although her name is known today, she made very little money from her feat and died a relative pauper. Annie Edison Taylor was the first woman to go over the falls and survive on her 63rd birthday. Photo via wikipedia. Most presidents have time to plan festive celebrations and arrange for gallant balls, state dinners, and festivities for their inaugurations. Theodore Roosevelt was a notable exception. On September 6, 1901, President William McKinley was visiting the World’s Fair in Buffalo, NY. It was an exciting event, with myriad developments from around the globe on display, but not everything was wonderful. President McKinley was assassinated in Buffalo. Teddy Roosevelt took the oath of office here as well. Photo via wikipedia. 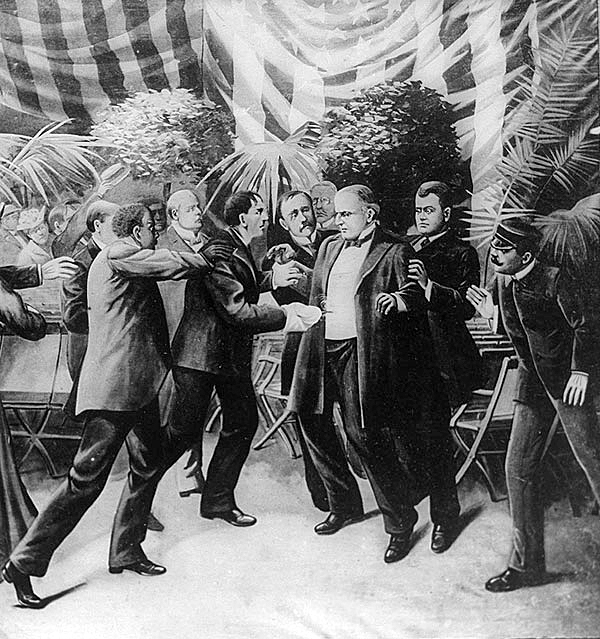 McKinley was shot by an anarchist, Leon Czolgosz, and died from gangrene 8 days later. 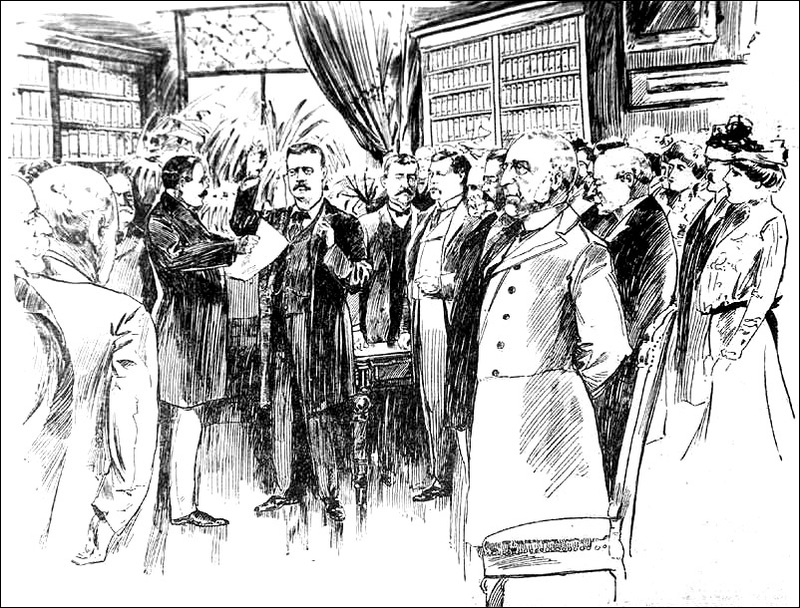 Vice President Theodore Roosevelt was rushed to the mansion of Ansley Wilcox, where he was sworn in as President on the morning of McKinley’s demise. Although an unexpected change in leadership that was ushered in by tragedy, Roosevelt’s presidency is remembered as one of the most influential in American history. The only image of Theodore Roosevelt’s oath of office. Press were banned from the home. Photo via wikipedia. The Museum has carefully preserved the atmosphere of the Wilcox home, but incorporates some modern educational features that both children and adults will find fascinating. Frank Lloyd Wright is the most famous architect in American history. Wright’s architectural style was very popular in this part of the country. More than a half-dozen Wright designed structures in greater Buffalo are open for tours. Although Wright fans will find both structures fascinating, the Martin House Complex is unique in its size and scope. Designed between 1903 and 1905, the complex is considered one of the best examples of Wright’s Prairie House ideal. 394 of Wright’s stained art glass designs can be found on the property, including his famous ‘Tree of Life’. Time took a toll on the complex, and three of the original buildings were demolished. Restoration efforts are well underway and were looking great when we stopped in. In addition to the six buildings of the complex (5 original and one later added for visitors), the landscaping of the Martin complex is a part of Wright’s design. The property now operates as a museum, and is rented out for small special events. A sub-collection of Japanese prints is also exhibited on the property. More than a museum of military & naval history, this park offers a beautiful outdoor space with a view of the water for families to stroll, and a chance to interact directly with USS The Sullivans, USS Little Rock, and a WWII submarine, the USS Croaker, are part of the experience here. Visitors can schedule an overnight stay for a more interactive experience of life in WWII. The USS The Sullivans and the USS Croaker Sub at the Buffalo and Erie County Naval and Military park. In addition to careful preservation of the three ships that comprise this museum’s exhibits, artifacts from the era are carefully placed on board, and include newspapers and recruiting posters. A historical timeline for WWII is open to the public. Displays for the US Civil War and WWI are currently under development, and should be open shortly. Sadly, the USS The Sullivans is named after the Sullivan family whose five brothers all died in WWII when their ship was hit by a Japanese submarine attack. This was the single biggest loss of life for one family in WWII. There are two delicacies of Western New York that you’re going to hear about. One is, of course, the chicken wings that bear the city’s name. The other is a sandwich known as a Beef on Weck. I had my first Beef on Weck on this trip, and I’ve had several since, because they’re delicious. I had never even heard of it before this trip. It’s basically a roast beef sandwich on a salted roll called kummelweck. There’s a hint of horseradish sauce and some au jus on the side. Do not confuse this with what is served at Arbys. These things are amazing, and will probably kill you, like all the other food in Buffalo. A “Beef on Weck.” Photo by Nick Gray via wikipedia. For Buffalo’s famous wings, you have a multitude of choices, and picking your favorite is like revealing your political affiliation. 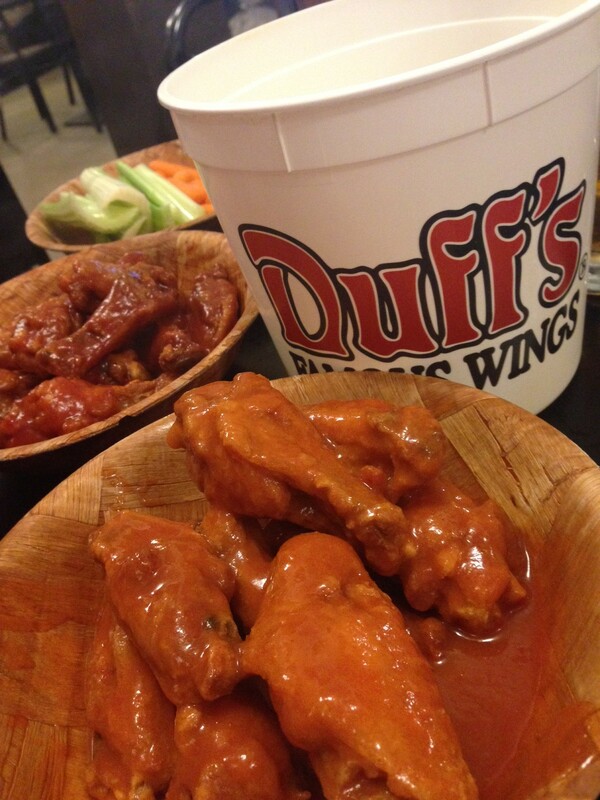 We went to Duff’s Famous Wings on a recommendation and were not disappointed, but there are so many to choose from, I’ll leave you to do more research. Most folks in the North don’t know what grits are, skip kale unless it’s in their smoothies, and think po boy is what you say to a little kid who scraped his knee – not a sandwich. From the name, you wouldn’t think Shango was a soul food Mecca. You’d be wrong. Shango’s menu is true southern cuisine, something I never expected to see north of the Mason-Dixon. Best of all, the food here has a touch of New Orleans in every bite. Creole and Cajun flavors and seafood share the menu with burgers, buttermilk fried chicken, and the creamiest mac’n’cheese I’ve seen in years. The rich, warm wood interior gives this spot the kind of atmosphere that makes you feel nice and toasty, and the food doesn’t disappoint. An award-winning wine list, eclectic beer menu, and neighborhood bistro feel make Shango a place you won’t soon forget. If your goal is low-fat dining, skip Chefs – unless you like salad (the selection is incredible, from dandelion greens to zucchini). On the other hand, if you’re in the mood for a mountain of spaghetti, more cheese than you knew could fit on one plate, or the name “garage pizza” brings up college memories and makes you hungry, you’re in the right place. 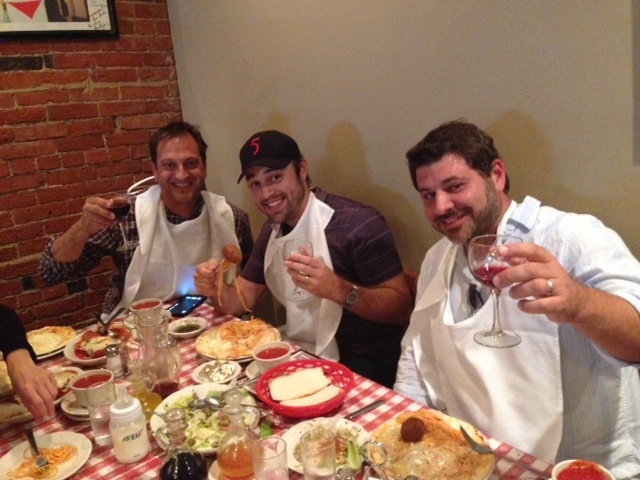 Famous in Buffalo for their spaghetti, Chefs’ real secret is their sauce…I won’t tell you more. You have to try it. They’re going to ask you a peculiar question at Chef’s after you place your order. “Do you want to parm that?” I had no idea what they were talking about, but I found out that they’re asking if you want a side of their world famous spaghetti parmesan. The answer to the question is, “yes.” Parm it. Parm the hell out of it. The Travel Thru HIstory crew at Chef’s Italian restaurant in Buffalo, New York. Photo by the waitress. Voted the best Italian restaurant in Buffalo, this family-owned eatery has been in business since 1923. The Billittier family, owners of Chefs, have been a part of the establishment since 1941 when the late Lou Billittier was hired as the restaurant’s dishwasher. By 1950, Lou was half-owner, and in 1954 he became the sole proprietor. Today, his daughter Mary Beth and son Louis John run the restaurant. Chefs embodies community spirit and something else – sports. Rumor has it that the Buffalo Sabres eat here before their home games. With no shortage of carbs on the menu, it’s easy to see why a hockey team with a need for energy gets their start here when they need reliable game fuel. For more information on a trip to Buffalo and Niagara visit www.iloveny.com.